Hanging out in the Colorado cold in the Deviator. If I've learned anything about winter outdoor fun over the years, it's the importance of finding a layering system that helps me manage my body temperature and is comfortable to move around in. Too many layers can leave me feeling like a stuffed sausage and guarantee I'm going to sweat, which is a recipe for disaster. Too few layers, or the wrong layers, and I'm cold, another recipe for disaster. But the complexity of layering in the cold doesn't have to stop you from getting outside. And as it turns out, some ideal next-to-skin layers might not look like traditional next-to-skin layers at all, like the Outdoor Research Women's Deviator Hoody. As part of another season of the #ORinsightlab team, Outdoor Research provided me with a complimentary Deviator Hoody to test out. Given the praise Backpacker Magazine shared for it, I had pretty high expectations, and (spoiler alert), the Deviator met them all. The Deviator Hoody features a combination of insulating, wind-resistant materials. Polartec® Alpha® insulation in the body of the hoody helps keep your vital organs warm, stays dry, and is meant to help circulate airflow. 100% nylon 7D ripstop covers the front body and back side panels to help prevent ripping. The hood, sleeves, and back panel feature Polartec® Power Grid™ fabric to help wick moisture and keep you comfortable. The Deviator features a full front zipper, elastic cuffs, a drawcord hem (which I didn't use), thumbholes, a zip chest pocket (which I also didn't use), and zipperless two hip pockets with ruching. But what makes the Deviator so innovative is the fact that it's a hybrid-style jacket. I found I was able to consider leaving layers I'd typically consider taking with me at home by adding the Deviator to my apparel stash, including a vest and baselayer. 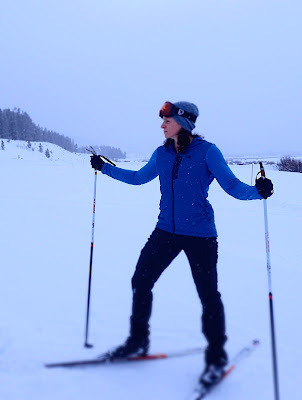 Taking a breather during my cross country ski adventure at Devil's Thumb Ranch. When I unpacked the Deviator to try it on, my first thought was, "am I supposed to wear something underneath this, or not?" It looks like a vest with sleeves, and given the presence of a full zipper, my first instinct was to layer under it. During the initial trying-on phase, I pulled on tight long-sleeved baselayer and tried to put the Deviator over it. I found there wasn't enough room for me to wear a long sleeved baselayer under it; it was too tight on my arms and the Polartec® Power Grid™ fabric stuck to the baselayer. I decided to go without a layer underneath for testing, and though it felt odd to zip something up over my sports bra with nothing in between, it was perfectly comfortable. The fabric is soft, cozy, and though I can layer a tshirt or tank top underneath, I found I didn't necessarily need to. A flap of fabric protects your skin from the zipper, and keeps wind out. Taking on the snow with one layer on top and one layer on the bottom! I'm usually a medium, but the size large fits my 5'9" frame perfectly. If you're in between sizes, or like a little room in your clothes like I do, size up. It's meant to fit tighter than your average hooded layer. The sleeves were long enough that I could use the thumbholes, something I don't often get to do, and the jacket was long enough to prevent wind from whipping through underneath it. 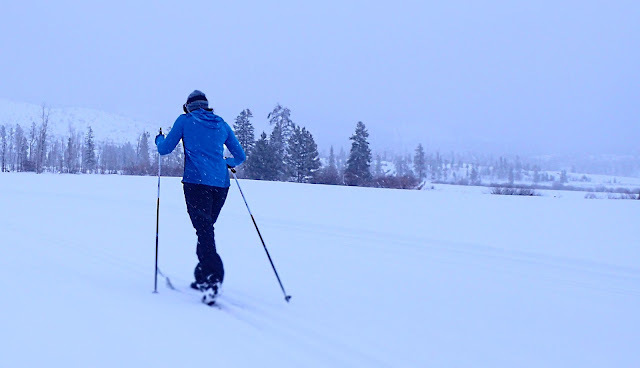 The toughest test I put the Deviator through was a full day of cross country skiing at Devil's Thumb Ranch in Winter Park, Colorado. Temperatures were in the 20-30ºF range, I was out for five straight hours, snow was falling non-stop, and depending on which direction I was facing, the wind was whipping through the trees and over exposed hills. Given such wintry conditions, I was thrilled with how the Deviator wore. A look at some of the different types of fabric that make up the Deviator. When I was moving, the sleeves breathed enough to prevent me from sweating too much while the insulated body kept my torso warm. The full zipper allowed me to control my body temperature, and the tumbholes fit perfectly over a pair of liner gloves. I was almost too hot in it while I was moving and in the sun, but grateful for the insulation and warmth when the sun disappeared and the wind started whipping. The fabric was soft next-to-skin, moved with me, and was incredibly comfortable throughout the day. Overall, I love the Deviator, and it's already become one of my go-to colder weather apparel favorites. 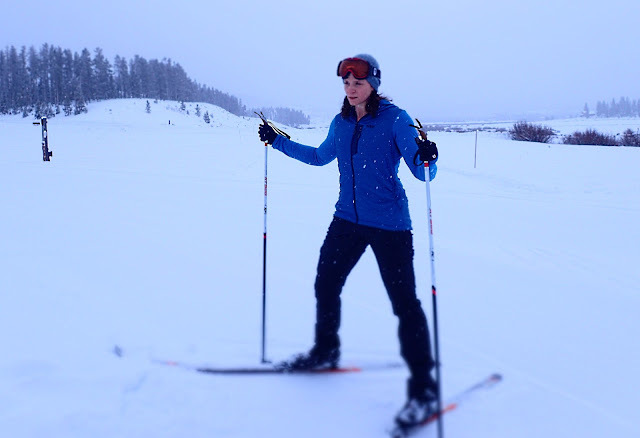 I can leave both a baselayer and vest at home if I take the Deviator out with me, and it functions as promised with respect to warmth, moveability, breathability, and wicking properties. It was weird not wearing a layer underneath a full zipper, but I was completely comfortable with it. 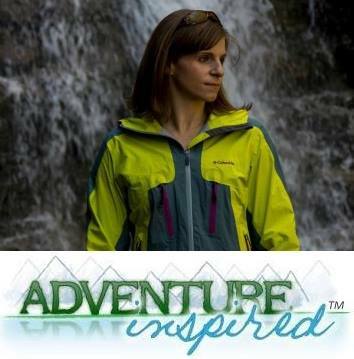 I'd recommend it to any outdoorsy lady interested in colder weather adventures or in simplifying your layering system, but consider going a size up, as this one runs a little small! Though I received a complimentary jacket to test from Outdoor Research, all opinions expressed here are my own. Also, as a note, there are affiliate links in this post, and I'll receive a commission for purchases made.